“Creative nonfiction” is a polite way of saying that the truth has been embellished, the facts have been garnished, and many parts have been made up for the entertainment of the reader or the writer, or both. Despite this relatively new literary classification, James Frey’s memoir was dubbed a lie, whereas Hunter S. Thompson famously got away with it—even had a banner raised to trumpet his self-styled appropriation of fact, and dubbed “gonzo journalism” by his editor. Thompson’s first published account of his foray into the pits of his mind was, oddly, on the subject of the Kentucky Derby in 1970. Now, almost forty years later, we’re faced with gonzo graphic design and New Catalogue’s latest pirating of historical events. The artist-team comprised of Luke Batten and Jonathan Sadler, called New Catalogue, have dabbled in the field of creative nonfiction before, notably by creating a quasi-real photographic record of the nature trail where Hitler mused on his writings. Their latest project stylizes several historical events: the death of United Nations diplomat Sérgio Vieira de Mello is conflated with the annual Paris-Dakar motorcycle rally, except the artists have relocated the destination to Darfur, the war-ravaged city on the other side of Africa. The rally’s finish line is always on the west coast of Africa, but New Catalogue’s map shows different. There is no clear link in the art between the transcontinental race and de Mello, who died in an Iraq bombing. The idiosyncratic pairing is noted in a poster advertising the rally, which is also a poster advertising New Catalogue’s exhibition, so that the dates of the rally self-referentially mirror the dates of the exhibition in this month of this year. This is internet-browsing stream of consciousness, where one Wikipedia page flows into another. Likely New Catalogue’s last graphic-design project, where former UN Secretary General Dag Hammarskjöld’s life story was given the graphic treatment, sparked interest in other UN heroes such as de Mello, but viewers aren’t really privy to all the inward turns—the search history—that brought them to the motorcycle rally. Rodney Graham, in his latest exhibition, delights in plopping the viewer into his sidecar for a trip through his synaptic mind. The first clue comes as a large lightbox photograph of a Wild West tableau. 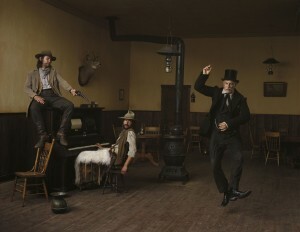 Costumes, the saloon’s player piano and mounted deer head all point to historical reenactment. Likewise, a nearby bicycle (yes, you can ride it) activates the Rotary Psycho-Opticon©, a prop that creates psychedelic visuals, as in 1960s rock stage theatrics. The meat of the exhibit, though, is what at first looks like a traditional painting show. Thirteen abstract oil paintings line a gallery, and these aren’t ordinary oil paintings—they’re made by Rodney Graham, the Renaissance Man and trickster, so you know something’s up. An adjacent gallery reveals his process. The story begins with a New Yorker-style cartoon—yet not so over-ambitiously highbrow—drawn by one Dan Kilgo (no information available; likely invented by Graham) who pokes fun at abstract art connoisseurs. Two paintings by “Picado,” one made in 1893 and the other 1942, hang side-by-side as a viewer remarks, “If you ask me, his earlier paintings were much better.” Meanwhile, the paintings are all but exactly the same except for a few squiggles, dots and whimsical shapes in different places on the canvas. In a moment of Vonnegut-like absurdity, Graham gets carried away with Kilgo-the-illustrator’s original attempt to “make” an abstract painting. 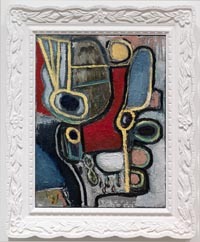 Graham produced seventy-seven variations on the illustrator’s faux-Modernist painting, but fails (as expected) at distilling any sense of mystery from the already watered-down fakes. Then, Graham actually made oil paintings inspired by the illustrator’s stereotype of Modernist painting. (There’s another step in-between the prints and the paintings, but you should go see the exhibit and be surprised). It’s difficult to like Graham’s faux-Modernist geometric abstract paintings as paintings. Sometimes painting is bad because it’s derivative of good art, even if it contains moments of real discovery. But Graham’s paintings are props. Their “impasto” is created from some sort of chunky plaster under-painting. They are derivatives of phonies, which means they need a lot of words to be explained away. The paintings almost too easily wrap up somebody’s graduate thesis on abstract art as decoration, our comfort with simulacra and the failure of contemporary painting via its reception. The paintings do succeed, though, as set pieces for the historical moment when taste was invented, recalling Francis Picabia’s first “bad paintings” at the dawn of irony. The line between lowbrow and high art, fact and fiction, has been drawn; Graham just dances on it.